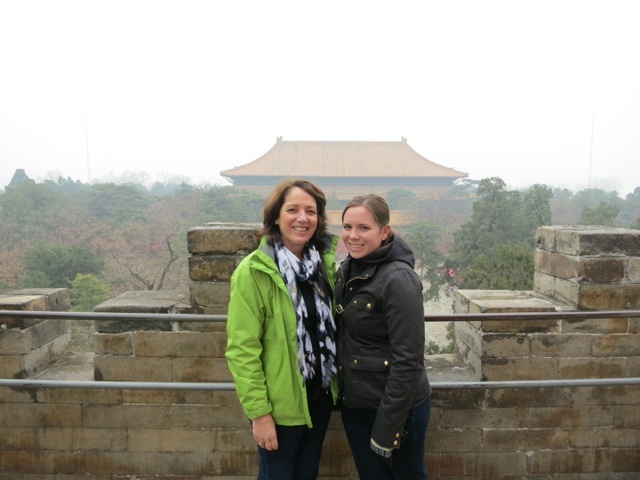 Travel diary from our 2012 trip to China with stops in Beijing, Xi'an and Shanghai. I never thought so many people would travel dressed up for St. Patrick's Day until today. The airport is flooded with green shirts, hats and scarves celebrating the day when everyone can pretend to be Irish. I did not dress for the occasion but rather am sporting my Cuse hat in support for today's March Madness game. I will board my flight about midway through the first half and not know the outcome until I land 14 hours later in Beijing. Hopefully I land to a Cuse victory over Kansas State! This year, I am flying by myself from Newark while mom and Aunt Pat leave from Toronto together. We should arrive within a couple hours of each other and then Dan will join us the following day. We will first travel to Beijing, then Xi'an and finish our journey in Dan's current city of residence, Shanghai. Added bonus: only 2 people in my 3 person row! My 14 hour flight was a seamless experience. Flying direct definitely made a difference in the trip. Last year when we went to SIngapore we had a layover in Frankfurt only to get back on the same plane two hours later and it messed with your sleep schedule. I spent the flight watching The Artist, The Descendants and some Grey's Anatomy. I wasn't anticipating how sad The Descendants was going to be as I openly wept in my seat. I landed two hours before mom and Aunt Pat and had some time to kill at the airport. I never have good luck connecting to wifi in foreign airports and this time was no different. All I wanted to do was know if Syracuse won the game and there seemed to be every obstacle in my way to find out. You had to scan you passport to get a code to login but after the first and second one didn't work out, I just gave up. Due to the fact that I couldn't connect to the internet and none of us had working phones in China I had to watch arrivals very closely because if I missed them coming out of the gate who knows how I would've found them! There were these meeting areas stations were you could watch screens of passengers coming out of the terminal. I know I nodded off here and there as I clutched my suitcase in front of me. I saw them on the screen as mom anxiously was looking for me and quickly walked over to the arrivals gate. After the first hugs and hellos, I asked about 'Cuse and was elated to hear the good news! Mom said they finally played like the team they have been. We met our guide and he led us to the cars. SInce Dan isn't meeting us until tomorrow, the three of us, the guide and driver were in one car and the suitcases were in another. We headed into the city along "airport road" and there was heavy traffic the entire way. It had snowed this morning but it had all melted. It is COLD and I am worried about being on the tour tomorrow with it being this cold but hopefully our Rochester blood will help. We had dinner at a bar in the hotel and the beers and food were great. Aunt Pat and I were sitting on a couch across from mom and all of a sudden the leg broke and the couch tipped significantly. Apparently our Western frames aren't built for their furniture here. Dan arrives tomorrow night and we can't wait to see him. This morning we woke up, showered and headed down to breakfast. Mom stayed in my room with me last night and Aunt Pat stayed upstairs. Pat had already eaten by the time we went down so mom and I ventured through the buffet by ourselves. Similar to Singapore and Indonesia they had both western foods just as omelettes, bacon and cereals but they also had an array of Asian cuisine, my favorite! I had a plate of pork buns, steamed beef buns, onion rings, bacon and eggs. Heart attack on a plate, but hey, it's vacation, right? After breakfast we met our guide, Chen, in the lobby to begin our day. Chen is a very nice man, about 50ish I would guess who is married and has a 24 year old son. He speaks Engligh impecabbly and has been very knowledgeable thus far. He will be our guide each day in Beijing and we hoped he was going to be just as informative as he was last night in the car ride from the airport. We met our driver, Mr.Lee, and he took us to the local Hutong, about fifteen minutes from our hotel. A hutong is one of Beijing's fast disappearing tradtonal neighborhoods. In 2004 when Beijing got the Olympic bid, they began tearing down the majority of the hutong's to make way for new construction and high rises. Upon arrival, we hopped in a traditional rickshaw to navigate the narrow streets. Although traditional, this rickshaw seems more along the lines of a Central Park, tourist type situation....but in the end, we are tourists. As our "driver" pedaled through the neighborhoods, we stopped off at different locations and Chen shared history or information about locals. The first stop was the local market where people shop daily as opposed to weekly trips. Here you could buy meat, fish, fruits, and fresh made pasta and buns. WIthin seconds of being in the market, you could tell that it would automatically fail every health inspection in the states or Canada. There was dirt everywhere and many of the merchants were smoking cigarettes as their ashes fell in thei fish tanks or on their food. When we passed the pork window, Chen explained that they do not like to waste any part of the animal and that was very clear as the large feet sat in the back behind the glass. Next, we were able to visit a local courtyard house where the same family has lived for over 70 years. The courtyard house is the traditional home in the Hutong and generations of the same family live there together. The family we visited has had countless visitors throughout the years and as the woman recounted, even "Michael Phillips" when the Olympics were here! Similar to Jakarta, the conditions of most of these homes in the hutong were very shanty and dirty. The kitchen was a tiny room filled to the ceiling with dishes and clutter but that's just how it is. After the hutong, went to a traditional Chinese tea ceremony at the base of a 700 year old bell tower. 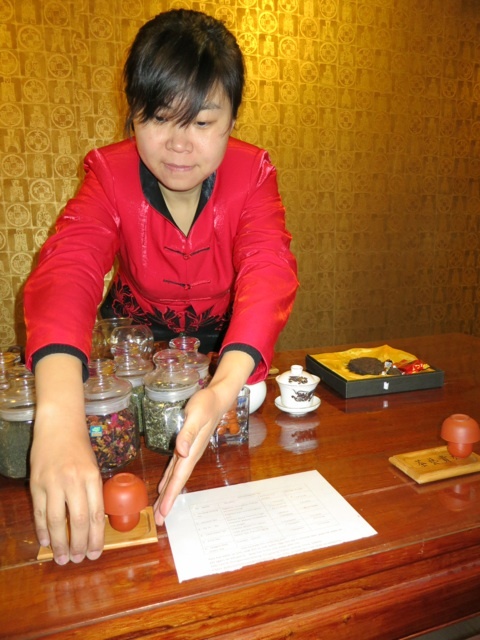 We sampled five different teas and learned about the ceremony itself. The woman teaching us spoke incredible English and hardly had an accent. We bought some tea and got a free souvenir of a little boy statue. The statue is used to test water temperature. You pour the water in the top of the clay statue and if it is warm enough the statue starts "peeing" and quirting water from the front. If it is not warm enough, it doesn't pee. Then, we climbed to the top of the bell tower that had views of the city. The steps were not the typical 8 inch height as mom pointed out and had to be closed to 11 or 12 inches! Quite the climb to the top and a test on mom's knees. Our afternoon ended with a trip to a Buddhist temple led by Tibetan monks and home to the world's tallest statue carved from a single tree, according to the Guiness book of world Record's, which Chen was weirdly overjoyed to showed us. We had a great lunch at a local restaurant of pork, dumplings, fried rice and bock chow. Aunt Pat wasn't a fan of how fatty the pork was, but she loved the dumplings! After our afternoon naps, we had terrible news from Dan. Unfortunately, his boss did not have the correct visas for them and ended up being investigated by the police. Dan had to go to Hong Kong to get a new Visa and that's why he was meeting us a day late. Then, the worst case scenario happened and all of the staff at his school were denied re-entry to China and were sent back to their respective home countries. Therefore, Dan is currently awaiting a flight in Hong Kong back to the States and will not be able to join us on the trip. We feel so terribly for him but he is dealing with the situation with immense grace and calmness. As Dan said, we will have seen more of China than he has because he has not traveled outside of Shanghai. We will miss him terribly and the trip won't be the same without him and his constant humor (and food knowledge!) but we will make the best of our time here. We got up bright and early and had breakfast in the hotel before meeting Chen. We headed to Tiananmen Square and Chen told us of the history and explained how they never truly got both sides of the story massacre. On the news here they only showed the students who were protesting throwing rocks at the soldiers and never saw any footage of the students getting killed. 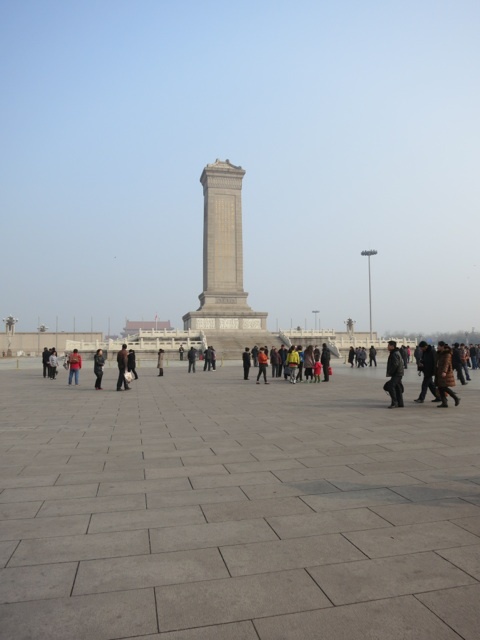 We headed through the square and across the street to the "Gate of Heavenly Peace" to enter the Forbidden City. This giant walled city, surrounded by a moat, was once almost exclusively reserved for the emperors (as well as servants, their wives, and concubines). The immense size of this city with its never ending buildings total 9,999 rooms. Chen described that if it had 10,000, it would have been bad luck. It took almost three hours for us to walk from one entrance to the complete opposite size. For how expansive the city was, the living quarters were very small. His bedroom was no larger than a typical NYC apartment. The reason they are so small is because of their fear of the evil spirit. If they lived in large open spaces, there would be more room for the evil spirit to linger. Speaking of the evil spirit, there are also large steps to enter any home or bedroom in the old parts of the city. This is because evil spirits cannot step up over things, they can only glide on flat ground. These two ideas seem to be opposing because if you had the step into your bedroom, then how could the evil spirit be lingering in your bedroom. Whatever the case, they are the most superstitious culture I have ever encountered. Next, we got back in the van and went to a restaurant in a local park. They brought out three different plates of meat (pork, chicken and beef), vegetables, soup, and like all meals, rice. Rice at every meal is my favorite! 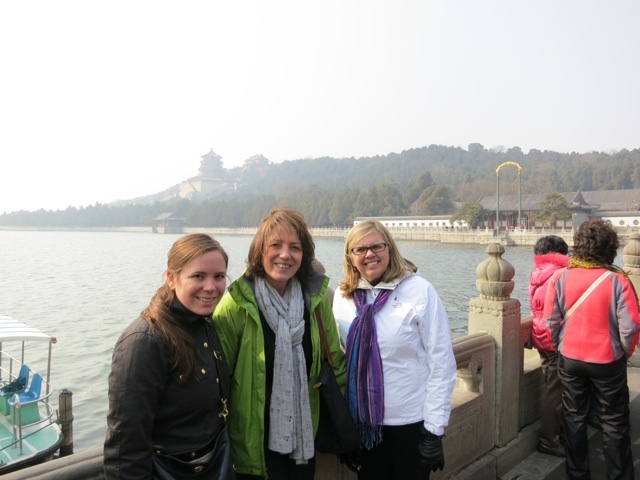 After lunch, we headed to the summer palace. The palace was the vacation home for the emperors and it was a very bizarre place. It had a large lake surrounded by mountains but all of it was manmade. After the lake was dug out, the used the soil to build the mountains. Many of the landmarks at the palace were replicas of other places in China. We learned a lot about the "Dragon Lady" who ruled through her three young sons. She seemed to be quite the woman who had very particular requests. 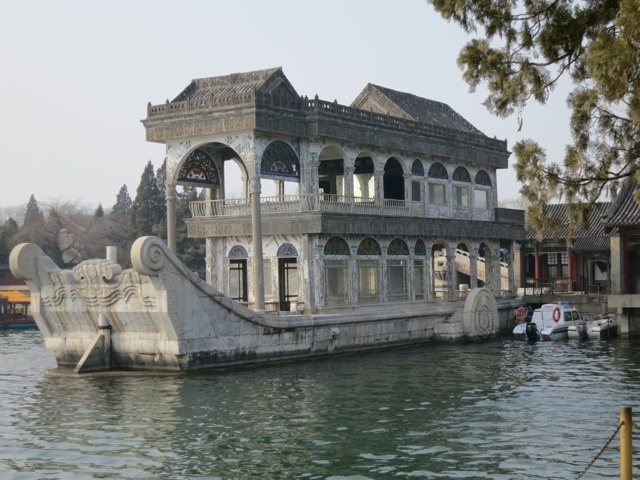 The first time she came to the summer palace and went for a boat ride, she claimed of sea sickness and had to go back to land. To please her, the people built a large marble boat that stayed "docked" on land so she could still be "on a boat". This among other crazy stories made it obvious why she was given the name the "Dragon Lady". Following the summer palace, we drove through the Olympic village and were able to see the Bird's nest and cube where swimming was held. The Bird's nest is such an incredible structure, I can only imagine what it was like to be inside! We were exhausted at the end of the day and laid low at the hotel. Luckily, the weather warmed up today and we were not freezing like yesterday. Tomorrow we head to the Great Wall! Today was so jam packed and I'm so exhausted, I can't seem gather many words. We began the day by heading to the Great Wall! What an incredible sight and its impossible to imagine how they made such a structure in the mountains over 2,000 years ago. The section we went to was over 600 years old and that was definitely the phrase of the day. I bet Chen said "over 600 years ago" over 100 times today. Today was all about the Ming dynasty, as we headed to their tombs after the wall. Our lunch was nothing to write home about, as dad would say, but yet hear I am writing home about it. The tombs were incredibly massive and it is mind boggling to see how these emperors lived (and died) and how many people dedicated their lives to serving them. We had a western style dinner in the hotel and as my eyes are closing, I can't seem to elaborate any more. We are heading to Xi'an tomorrow at 5:00pm, so I'll have time at the airport to update. 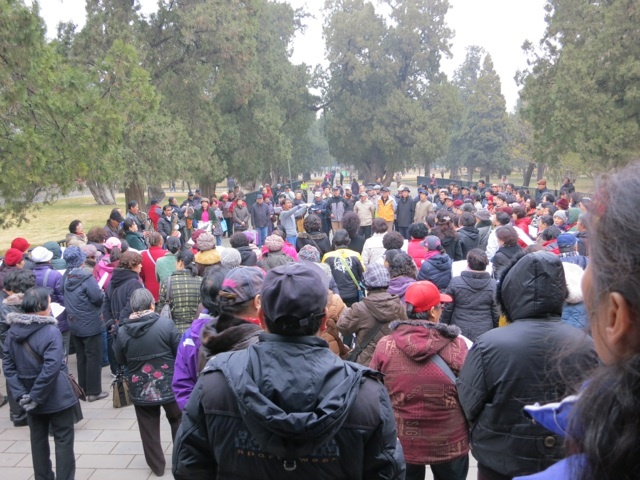 Today we didn't have anything planned on our itinerary but Chen suggested we go to the Temple of Heaven park where we could see locals in their daily routines as well as another temple that was used for sacrifices. Chen explained that since everyone in the country must retire at 55, most people spend their days at the park exercising and playing cards and majan. Oh how they love that game here, literally everyone plays it! When we arrived at the park, it was like nothing I had ever seen. First there was a large group taking a dance class, then tai chi, then line dancing, and a also a game like hacky sack that has feathers attached. Once we walked a little further, we saw what I can only describe as a playground for adults. Imagine a playground similar to the metal ones you see locally, take away the slides and swings and add hundreds of people 60+ all working out in street clothes. They are stretching, exercising, twisting, turning and bending in ways I have can't even do at 25 years old. Mom kept commenting that if people in the states stretched this much, they would never have hip problems or need joint replacements. One man Chen spoke to told us he was 82 years old! I took multiple videos that hopefully I can post when wifi is faster. We all joined in on different exercises but were mostly laughing more than getting any aerobic accomplishments. After the adult playground (sounds dirty, I know) we walked through some corridors where they used to do the slaughtering for the sacrifices. Nowadays, you see lines of people playing cards, chess, majan and some ladies knitting. Chen explained how they will do this all day and each group meets here and keeps continuous score for gambling purposes. In the midst of the gambling, we came upon a large group of people who seemed to be spontaneously singing, but there was a band, conductor and many people had song lyrics in their hands I guess when you are forced to retire at 55, you come to the park and hang out with your buddies all day? FInally, we saw the building where the ceremonies took place "over 600 years ago". Unlike all the other temples we have seen, this one had more of a cone shape and its architecture was very unique. We headed back to the hotel and had a couple hours in the room to pack and relax before heading to the airport at 2:00 for our 5:00 flight. We said our final goodbyes to Chen and departed for Xi'an. Our new guide, Chris, met us at the airport. She could not be more opposite than Chen as she is probably in her late 20s and giggles a lot. I hope she doesn't giggle all day tomorrow, tonight in the car ride back to the hotel, she giggled after after almost everything. The hotel in Xi'an is not quite as nice as Beijing, but I'm sure it will be fine and anyways we are only here for two nights. Terracotta Warriors tomorrow!